Your Ruby Princess cruise is sure to impress! This ship offers up to 900 cabins with balconies plus a slew of remarkable features that are consistent with any of Princess Cruises' ships. Choosing any Ruby Princess itinerary to the Caribbean will leave you wanting more. 1. "We thoroughly enjoyed our cruise..."
2. "Overall, we loved it. Princess treated up us well, our cabin steward, Reggie, was moved to our area and was new but really did a great job. Room with balcony awesome, clean, plenty of room..."
3. "LOVED the Entertainment staff. Top notch and too much fun..."
4. "This was my wife and I first cruise and it met every expectation that we had..."
1. "The food in the dining rooms and buffet were only "so-so". Not really good, but not terribly bad..."
2. "Crew members were reluctant to become friendly with passengers, unlike on Carnival and Royal Caribbean, crew staff always wanted to hang out and get to know the passengers." You will be awed when you first get on board. 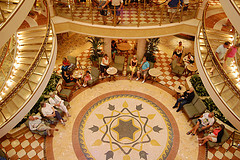 The ship has a beautiful meeting place - a piazza - where you can relax, grab something to eat, just watch your fellow passengers, or enjoy street entertainers. If you are into dipping and splashing, you will have several pools and hot-tubs from which to choose. There are separate areas for kids, teens and adults to hang out and have fun. Adults have their own "Sanctuary", and there is a wedding chapel onboard for those wishing to get married at sea. You will also be impressed with the Ruby's fine dining - there are formal dining rooms, specialty restaurants and the customary buffet area. The Ruby Princess offers some Caribbean dishes and has several Caribbean-named areas such as: the Cafe Caribe and the Calypso Reef and Pool. Get lost in organized activities, an art auction, the library, a state-of-the-art fitness center, a nine hole putting course and virtual golf simulators. At night go dancing (check out the Skywalker's Night Club), watch movies under the stars on a giant Times Square like TV screen, or enjoy a professionally choreographed theater production. There is just too much fun stuff to do on a Ruby Princess cruise! 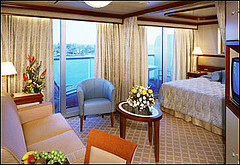 The "Ruby" offers cruise packages to the eastern and western Caribbean. 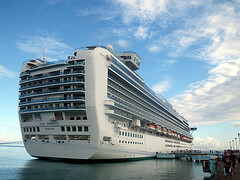 The Ruby Princess sails out of the Ft. Lauderdale Cruise Port to the Caribbean. The ports of call included in a Ruby Princess itinerary are among the hottest spots in the Caribbean. Expect to visit places like Grand Cayman and Cozumel on a western Caribbean cruise; and, St. Thomas and St. Maarten on an eastern Caribbean cruise. 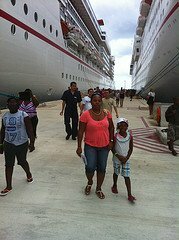 Your Ruby Princess cruise will also make a call at Princess Cruises' private Bahamian island, Princess Cays. One bit of misfortune to note is that you will not find year-round Caribbean sailings. 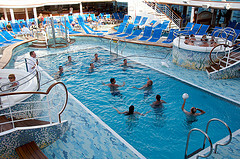 The Ruby Princess offers Caribbean itineraries during winter and the early spring months (December - April). It then goes off on Transatlantic and Mediterranean sailings. Check with your Travel Agent for available Caribbean sailings. Note: Itineraries are subject to change. There is a 4 Night Western Caribbean Cruise from Ft. Lauderdale to Cozumel. This is a limited offering. There is a 9 Night Western Caribbean Cruise from Ft. Lauderdale to Grand Cayman, Cozumel, and Princess Cays. These sailings are also limited in number. There is a 5 Night Eastern Caribbean Cruise to: Princess Cays, Bahamas and Grand Turk, Turk & Caicos Islands. There is a 7 Night Cruise from Ft. Lauderdale to: Princess Cays, St. Maarten, St. Thomas and Grand Turk. As noted before, you will not find a Ruby Princess cruise to the Caribbean year-round. However, if you can travel during the winter or spring months, I urge you to check out the "Ruby." Your family will have fun-times on board this remarkable Princess cruise ship!